Some really nice people had to give me up because they couldn’t take care of me anymore. You see, I had something like a stroke in my spinal cord, and I required some pretty intense medical assistance for a while. As Good as Gold took me to a neurologist to find out what was going on, and it turns out that my problems should get much better as time goes on. My foster parents have taken such good care of me. They help me do my exercises and take me to underwater treadmill therapy. Now that you know about the hard part, let me tell you about all of the good stuff. 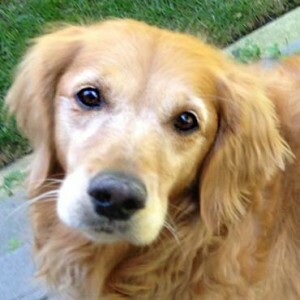 I am an eight-year-old golden girl and I just LOVE the tennis ball! I have actually fallen asleep with it in my mouth. I think playing fetch is what has helped me so much with my rehab. Foster mom says I’m the complete golden package – I’m sweet, loyal, smart and I love cuddling, with people or my stuffed toys. I even do a happy spin at mealtime that is just like that cartoon guy, Snoopy! Cats are fine with me. If they get near my dinner, I just shush them away. Going for walks is one of my favorite things, and the doctors recommend lots of walks to help build my strength. If you want to hear more about me, my foster mom can tell you everything. But you’d better have lots of time, because she can’t stop saying nice things about me!